Have you ever made, or tried Thai larb? Some refer to it as laap, lap, lahb, but I’ve always know it as larb. Regardless, it could possibly be one of my favorite Thai dishes, and it’s one I make quite a bit, probably because of the fresh herbs, and the overall flavor profile. It’s everything you expect in a great Thai dish. It’s sweet, sour, and spicy, and it’s a dish that my kids really love, maybe because they get to eat with their hands, wiping up the larb with sticky rice. I’ve done a bunch of different things with larb such as larb quesadillas, shrimp larb, and even larb bao, only to name a few, but this time I wanted to actually combine the rice and the larb together to make this awesome Thai larb fried rice. Whether you go straight for the larb recipe, or fry in your rice, I guarantee you will love this recipe. Let’s just say my oldest devoured most of the entire fried rice, it was that good. Add the oil to a large skillet and warm it to a medium, high heat. Once the oil is heated, add in the ground pork. Once the pork is nicely cooked, add in the shallots, chilies, fish sauce, palm sugar, lime juice, mint and basil, as well as the toasted rice powder. Give this a good stir, and cook for about another 4 minutes. Remove the mixture from the skillet and place into a bowl. Now let’s start on the fried rice portion. Wipe out the skillet, and place back onto the stove on medium heat. Add in the butter, and cook until it gets nice and bubbly, but not browned. Add in the cooled rice, and using a wooden spoon, gently stir, and press down, breaking up the rice. Once the rice softens a bit and begins to steam through, raise the heat a bit, and then add in the Thai larb. Gently mix, caramelizing the rice and larb. Once you have a nice fried rice, taste and season with any salt. When you are ready to serve, place in serving bowls, and serve with a nicely fried egg, if you desire. Garnish with roasted peanuts, fresh mint, and any additional Thai bird chili peppers if you desire. Again, larb by itself is so tasty, but now when mixed with a fried rice, well let’s just say the game just got better. 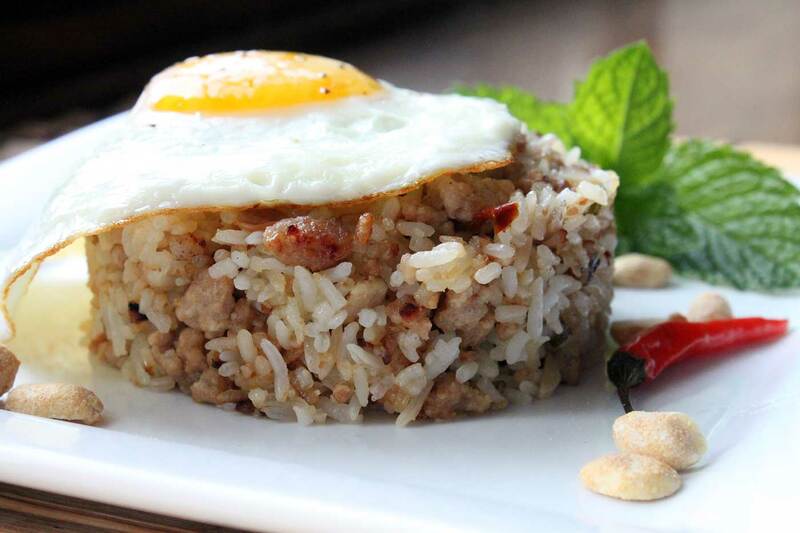 Did I mention that when you cut into the sunny side up egg and the yolk runs into the Thai larb fried rice? Whoa. It’s great. 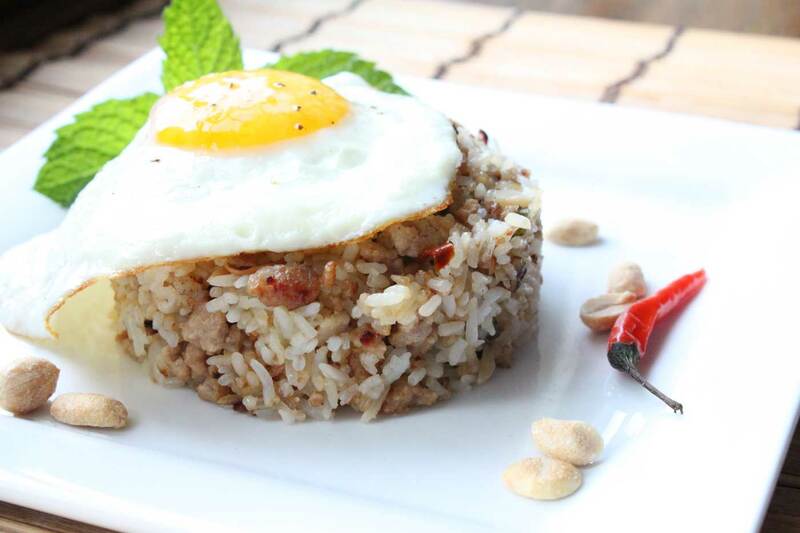 If you are looking to change up your fried rice, or even try Thai larb, I would highly recommend this recipe. Hope you all enjoy!